Ricky arrived at Jungle Friends after he was finally released from a laboratory doing iron-toxicity studies. He died from kidney disease and everyone at the sanctuary is feeling his loss. It is with a heavy heart that I tell you Ricky left us. He was the first Ironman here at Jungle Friends to pass and not a day goes by that we don't think fondly of Ricky's sweet face and his welcoming smile. Ricky arrived at Jungle Friends after he was released from iron-toxicity studies. He died from kidney disease and everyone at the sanctuary is feeling his loss. "Whenever I made my routine visits to "Oz," I always knew which "Oz Boy" would be the first to appear in his runway, anxiously awaiting my arrival - Ricky. He was always so happy and excited that I made sure Ricky was one of the first I would visit. We had a routine. I would first give Ricky snacks in his runway, and when he finished those, he would climb into his habitat and onto the ground. Here he and I would have our visit, while Ricky ever so gently selected his favorite snacks: cashews, walnuts, raisins and grapes. And during the remainder of my time spent with the other "Oz Boys," I would continue to indulge him as he followed my every movement. Ricky's beautiful signature smile belied all that he had endured: his capture in the wild and separation from his family was followed by many years in research. Small in stature, Ricky had a sense of vulnerability about him that made me appreciative of his trust and friendship and endeared him to me. My sweet Ricky, Your time with us at Jungle Friends was too brief. Farewell, little Ricky, my dear friend." I want to send out a very special thank you to all of our wonderful carestaff for making Ricky's life here at the sanctuary so very special! 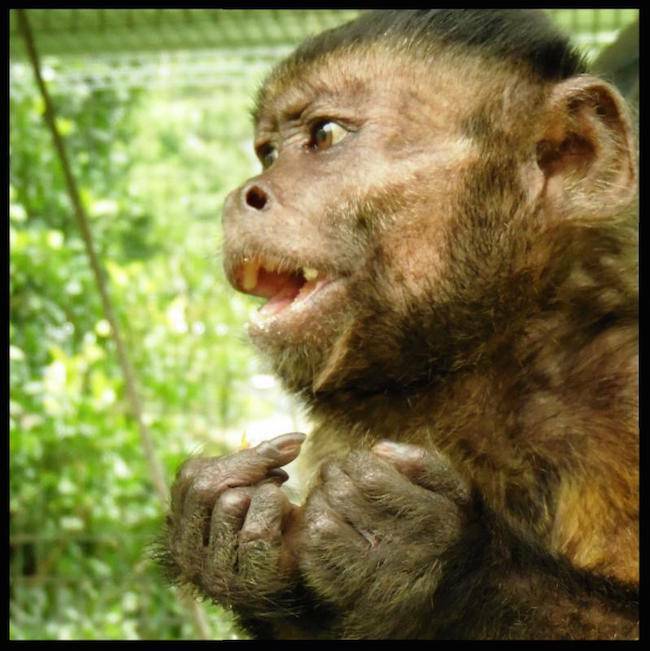 Please donate to Jungle Friends' Monkey Medical Fund!